Liner Notes: A tour de force in the literature of failure, recording the last days of the Sixties icon and darling of Andy Warhol's Factory. In 1982, Nico, former model, actress, singer with the Velvet Underground and part of Warhol's entourage, was living in Manchester, England, far from her 15 minutes of fame and interested only in feeding her heroin habit. Local promoter Dr. Demetrius saw an opportunity, hired musicians to back her and set off on a tour of Italy. This is Nico's last "scene," with keyboard player James Young acting as a Rock Boswell, recording the final days of a celebrity in the twilight zone of faded fame. This story of Nico and the characters who orbited around her — people whose lives are rarely sung int he deafening hyperbole of rock history may be the truest book yet written about life inside the rock world. 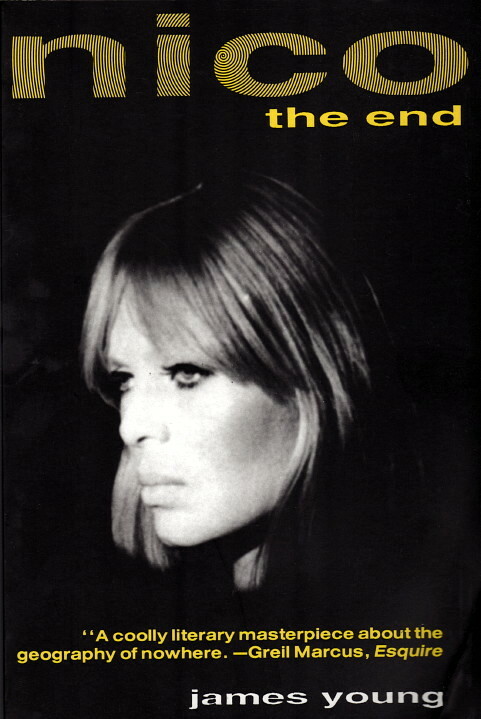 "Nico: The End is a coolly literary masterpice about the geography of nowhere. It is cutting and cruel and most of all sardonic... As a rock'n' roll road book, Young's clear-eyed memoir is the record of an infinitely slow navigation of a dead end." "This is a very funny memoir of Nico's final years, a well-written black comedy." "A black comedic testimony of the real rock'n'roll underground."